While mobility has become, since the 1980s, the principal defence employed by Surface to Air Missile batteries to evade attack, defensive aids are being deployed increasingly as standalone components or as part of integrated defensive packages on radars and other key IADS components. Deployed S-300PMU/SA-10C 5P85SU smart TEL of the Slovakian Army (Image © Miroslav Gyűrösi). The 1990s were a period of important changes in how Russian designers and technological strategists viewed the problem of air defence. 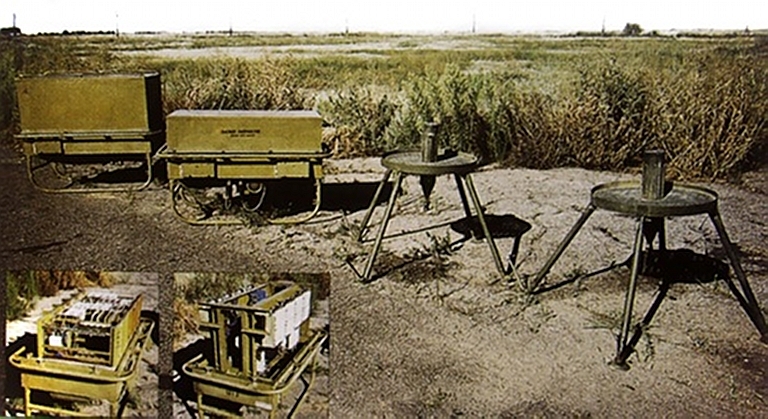 While mobility emerged as a design issue during the 1980s, as the Soviet PVO moved from static semi-mobile SAM batteries to fully mobile batteries with the deployment of the S-300PS/PM SA-10B/C Grumble, the introduction of more comprehensive defensive aids for air defence system components became a priority after Desert Storm. The 1999 Allied Force air campaign was a pivotal event. 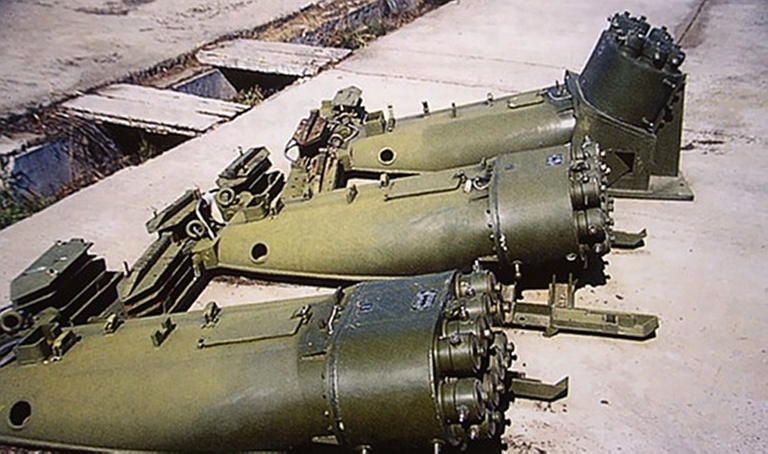 Serbian 9M9 Kvadrat / SA-6 Gainful SAM batteries largely evaded destruction by use of disciplined shoot-and-scoot tactics, and the Serbians claimed that many AGM-88 HARM anti-radiation missiles were seduced by emitting decoys. Current Russian thinking, emulated closely by the Chinese PLA, is to construct air defence systems with comprehensive defences to maximise the survivability of all system components. Maximum mobility for all IADS components, encompassing not only missile battery engagement radars and TEL vehicles, but also battery and sector acquisition and surveillance radars and passive sensors. Active defence of high value IADS components such as radars by the deployment of optimised point defence SAMs and SPAAGs, such as the Tor M2/M2E / SA-15, Pantsir S1E / SA-22 or LD-2000, intended to kill inbound PGMs such as the AGM-88 anti-radiation missile family, and the Paveway, JDAM, JSOW and SDB families of weapons. Deployment of dedicated mobile counter-ISR Electronic Counter Measures equipment such as the SPN-2/3/4 and SPN-30/40 systems, to defeat high resolution multimode radars in combat aircraft. 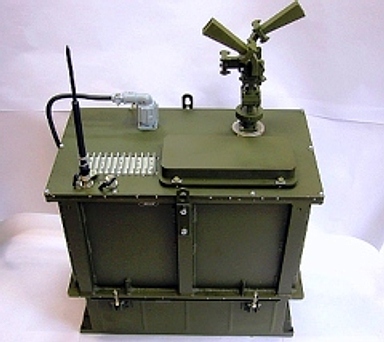 Deployment of often comprehensive defensive aids suites on radars or with SAM batteries, to frustrate terminal seekers in PGMs as well as ISR systems used to target such PGMs. Defensive aids, whether operated individually or as part of a suite, usually comprise a mix of decoys, camouflage, and specific countermeasures intended to disrupt or degrade the operation of specific categories of sensor or guided weapon terminal seeker. A broad array of products is now on offer, some as standalone components listed in catalogues, and some as part of existing equipments. Unclassified technical literature discusses a range of techniques for defeating ARMs and emitter locating receivers, ranging from coherent decoy emitters to intentional distortion of the wavefront produced by a radar to introduce errors into interferometric DF receivers. What we are observing in IADS component protection is mirror image of the 1960s effort to equip combat aircraft with onboard threat warning systems and defensive aids, reflecting the reality that a modern long range SAM battery is an expensive asset, with a late model S-300PMU1/2 battery priced at US$100M to US$200M, depending on configuration. This webpage is intended to describe many of the better documented defensive aids available for IADS components. RWE-1 MAWS with its four low UHF band Yagi antennas deployed (via R.D. Fisher). 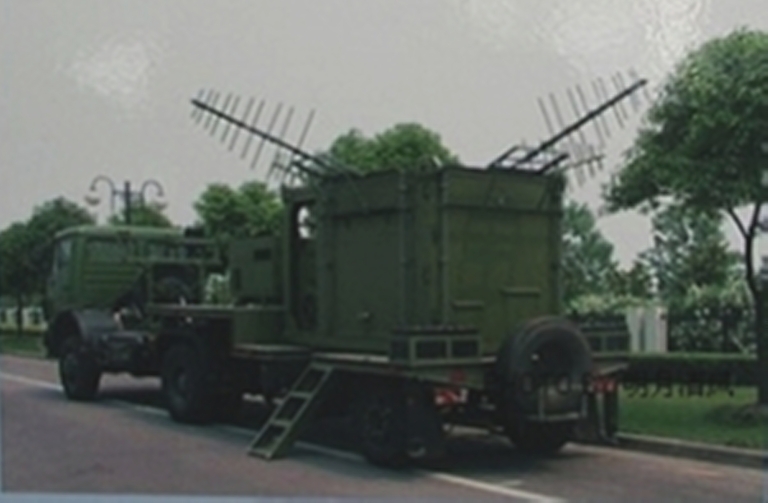 The Chinese RWE-1 is a radio-frequency band active MAWS intended to protect SAM batteries from attack by anti-radiation missiles such as the AGM-88 HARM/AARGM series. It is employed to trigger emitter shutdown and activation of active emitting decoys. The manufacturer's brochure claims a detection range of 40 km / 21.6 NMI. DF capability is likely to be via amplitude comparison between channels, providing ~10° DF accuracy, adequate for cueing decoys, or cueing point defence weapons like the LD-2000 to acquire, track and engage the inbound missiles. The VNIIRT 34Ya6E Gazetchik E series of systems combine a MAWS and radiating decoy capability intended to defeat seekers in anti-radiation missiles, with a capability to deploy aerosols and chaff to defeat radar and electro-optical targeting systems and guided munition seekers. Missile Approach Warning System (MAWS) to detect inbound ARMs. Chaff dispenser to defeat MMWI weapon seekers. Aerosol (smoke) generator to defeat electro-optical seekers / sensors. Decoy emitter operating in the band of the defended emitter. The system is keyed to emit by the radar system it is defending. To date there have been no disclosures on whether the Gazetchik is a coherent emitter using a reference signal from the radar, or whether it synthesizes its own decoy waveform. VNIIRT statements on the Gamma DE would indicate a coherent capability. A number of configurations are offered with and without dispenser capability, and with band specific emitter capability. 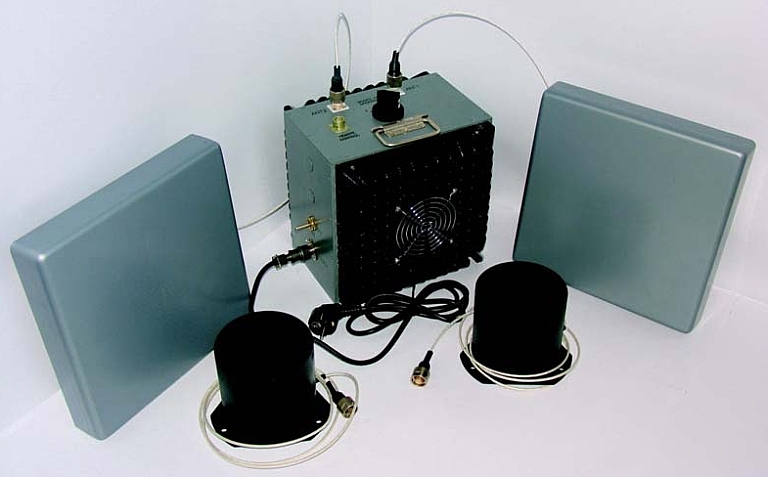 VNIIRT offer the system integrated with the Gamma DE series of L-band AESA radars. 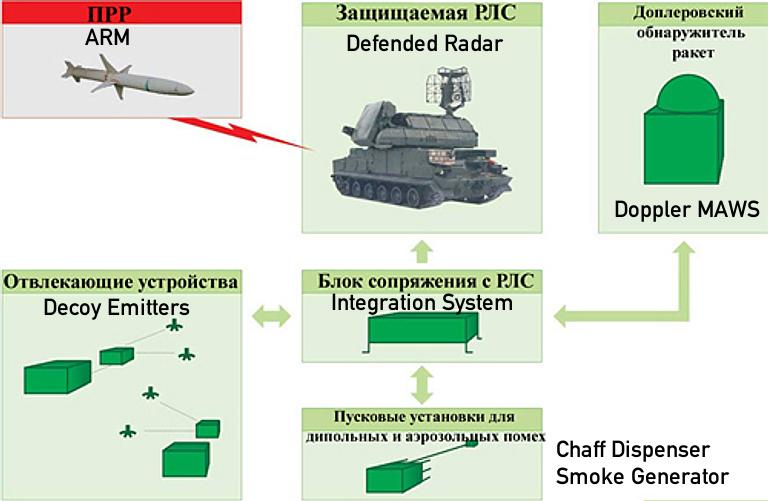 The ByeloRussian KBR Integrated Defensive Suite combines a Doppler MAWS, multiple emitting decoys and a chaff dispenser / smoke generator to provide a defensive capability against ARMs and MMWI / EO guided PGMs. It is intended to degrade the accuracy of airborne emitter locating systems and ARM seekers, and provide a radar crew with early warning of an attack in progress. 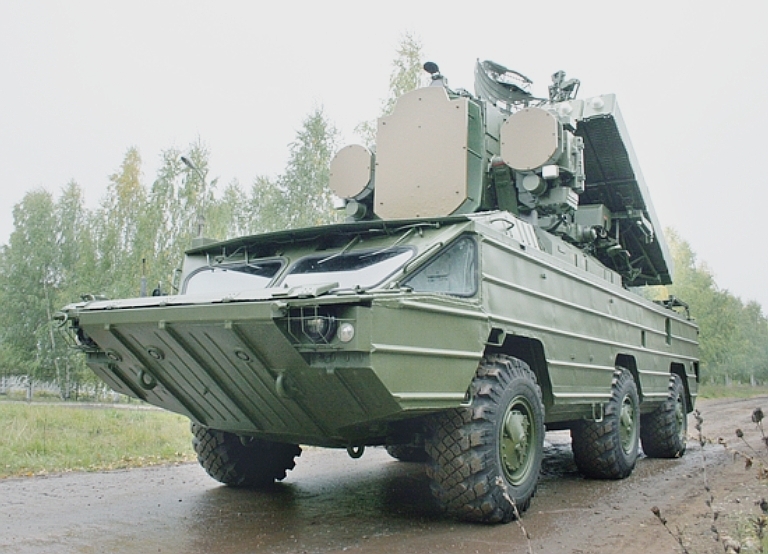 Tetraedr in Belarus offer the SRTZ-2TM Anti-Radiation Missile defensive package for the upgraded Pechora 2TM / mobile SA-3 Goa SNR-125-2TM engagement radar. 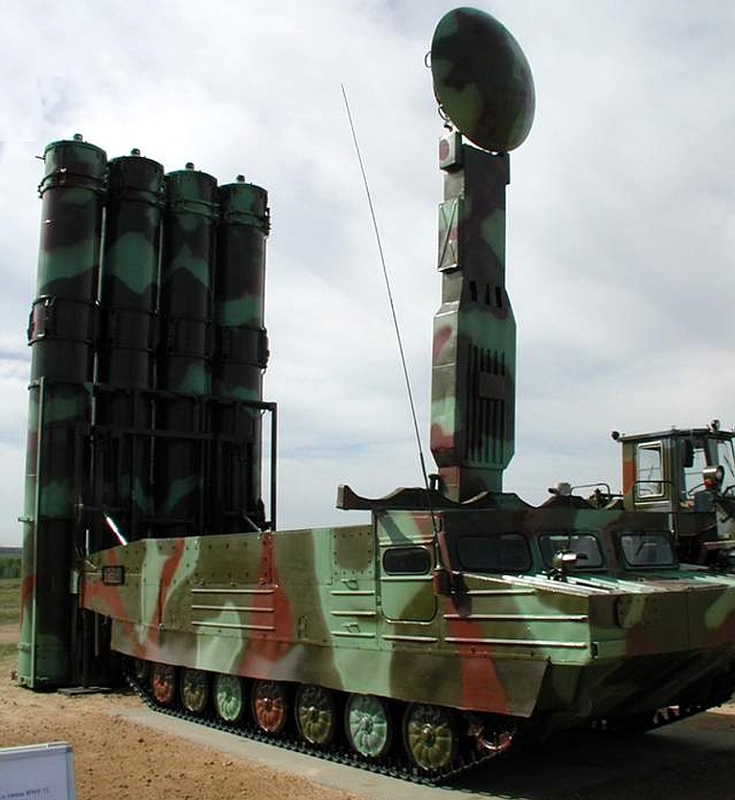 They have also stated that derivatives are available for the S-75 / SA-2 Guideline and legacy S-125 / SA-3 Goa SAM systems. The system is intended to defeat the AGM-88A/B/C HARM, the AS.37 Martel, MBDA ALARM, Delilah, Kh-31 and Kh-58, as well as loitering ARMs in the class of the AGM-137 Tacit Rainbow. The system is claimed to be effective against ARM homing seekers, ARM guidance packages with GPS midcourse control, and is claimed to provide a capability to defeat MMWI and EO/IR seekers. Claimed Pk is 95% for a single round HARM attack, 93% for a two round attack and 90% for a four round attack, with Ps for the SRTZ-2TM cited at 93%, 92% and 90% respectively. Unlike competing decoys which are deployable, the SRTZ-2TM is a self propelled design carried on a MAZ-6317 6 x 6 truck, with an integral 20 kW diesel generator and 5 minute shoot-and-scoot capability. The design is unusual in that it employs a pair of antennas, each with pressurised waveguide feeds, one is mounted on the roof of the truck, the other on a deployable telescoping 5 metre boom. A phase control module is employed to create a virtual phase centre for the emitter pair, with the decoy acting as a false target generator. The decoy receives emissions from the defended radar via a separate receiver channel and uses these to synthesize the coherent seduction waveform. Antenna azimuth coverage is 360° and elevation coverage between 15° and 80°. Tetraedr have not disclosed whether DRFM technology is used in the waveform generator, nor have they disclosed what other countermeasures may be carried by the system. 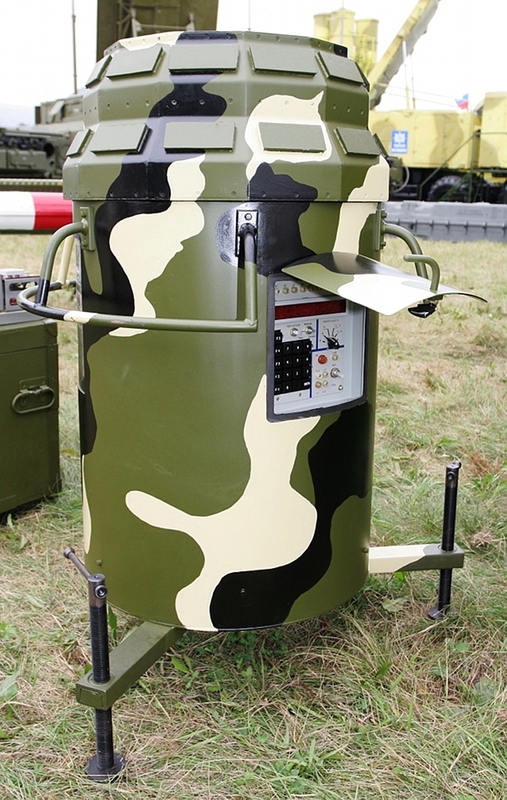 The joint Russian-ByeloRussian Defense Systems company is producing an emitting decoy system for their upgraded S-125M Pechora M / mobile SA-3 Goa system. Designated the KRTZ-125-2M, the decoy was developed to protect the UNV-1 Low Blow engagement radar from ARM attacks. 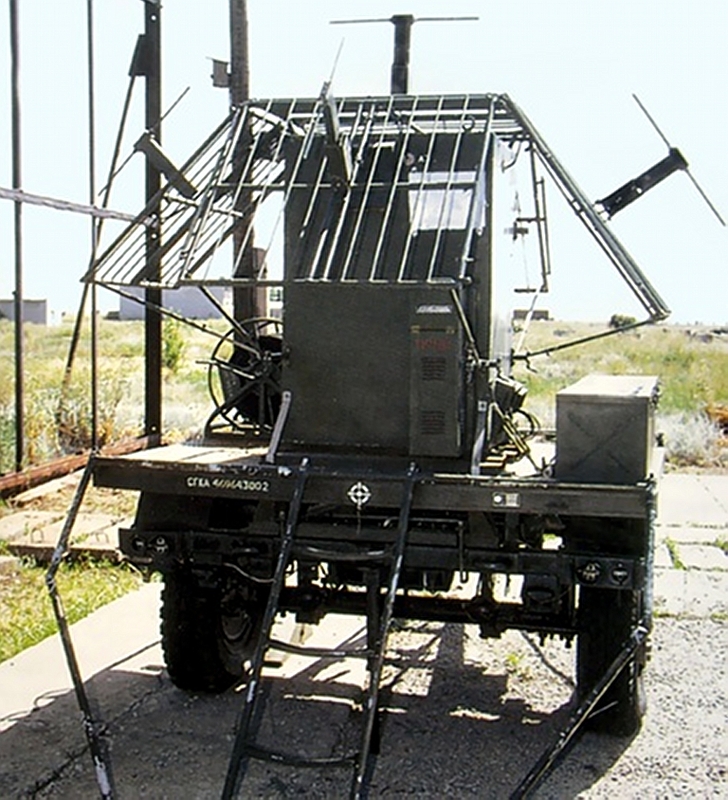 It has been exported to Egypt and derivative designs for other former Soviet SAM systems are on offer. The system comprises an OI-125BS control unit which drives via radio link interfaces six OI-125 Emitter Modules, which are typically arranged in a ~300 metre diameter circle, with configurations of four to twelve emitters available. 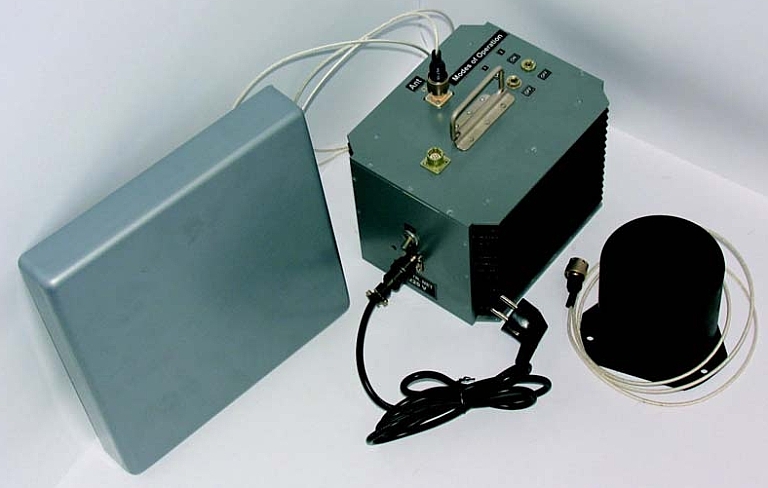 The OI-125BS is has cable or radio link interfaces to the UNV-1 engagement radar's UV-74 synchronisation controller and UV-82 missile uplink transmitter. A test set, spare parts package and mains/generator power supply/charger are included. The OI-125 emitter modules can be powered by cable or from internal batteries. 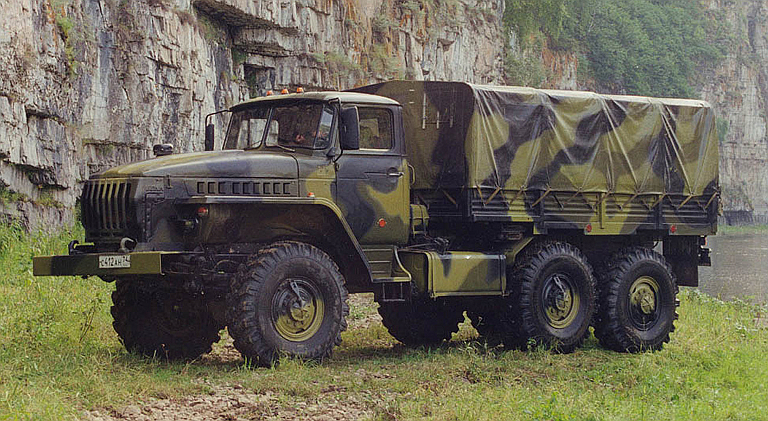 The whole system is transported by Ural-4320 6 x 6 truck. In operation, the emitters are under the control of the OI-125BS which derives its timing information for emission from the UNV-1 Low Blow. Each V-pol emitter will match or exceed the EIRP of the Low Blow transmit channels. Each emitter has an internal frequency synthesiser which is tuned to within ±1 MHz of the UNV-1 carrier frequency. The controller monitors the status of the emitters, and if an incoming ARM destroys an emitter, automatically reconfigures the array. Cited Pk is ~90% for a single round ARM attack, and ~80% for a two round attack. Defense Systems via Miroslav Gyűrösi. The KRTZ-125-2M decoy system is transported by Ural-4320 6 x 6 truck (Avtomobilniy Zavod Ural). OU-1 decoy (Images © Miroslav Gyűrösi). 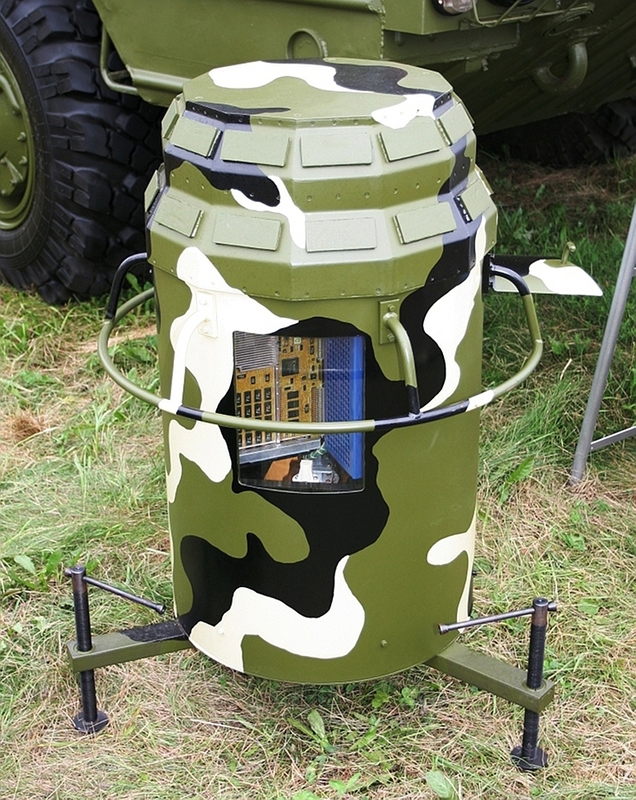 Revealed first at the MAKS2005 show, the OU-1 is a relocatable decoy system designed for the Osa AKM / SA-8 Gecko SAM system upgrade package. It employs a circular array with twelve paired transmit and receive antennas operating at 7.5 GHz, and each covering 30° in azimuth and 40° in elevation. Average power is cited at 50 W with peak pulse power at 40 kW, and power consumption is cited at 300 W.
Upgraded 9K33M3 Osa AKM / SA-8 Gecko. 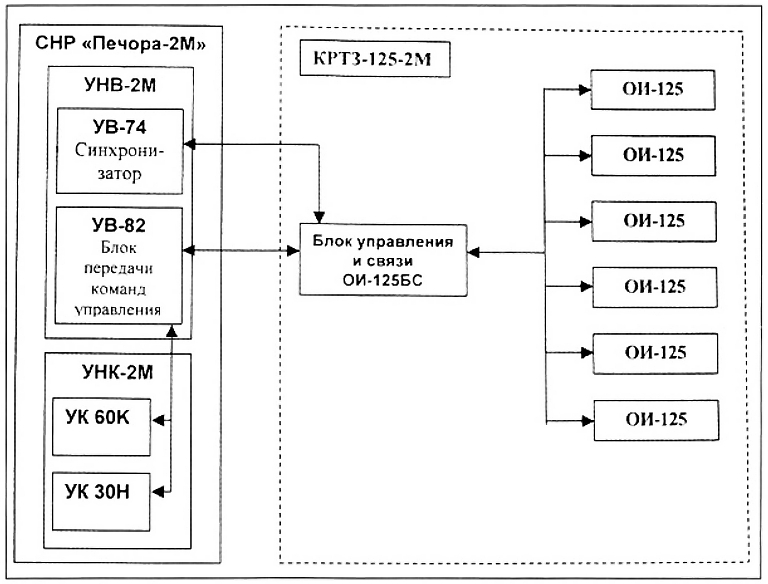 Aviakonversiya high power GNSS jammer. Aviakonversiya low power GNSS jammer. Aviakonversiya have widely marketed their satellite navigation signal jammers, and these devices were claimed to have been used by Saddam's regime during the 2003 OIF bombing campaign to degrade the accuracy of US JDAMs and other GPS aided PGMs. The Head of Aviakonversia, Dr Oleg Antonov, in a Russian media interview stated that their low power jammer design has an EIRP of ~2-3 Watts and an effective range of ~50 km, and the high power derivative has an EIRP of 20 Watts and effective range of ~150 km. The jamming waveform has not been disclosed. While more sophisticated CRPA antenna technology and active nulling will be effective in rejecting the jammers, less sophisticated equipment, especially low cost man portable and vehicular equipment is likely to be susceptible. 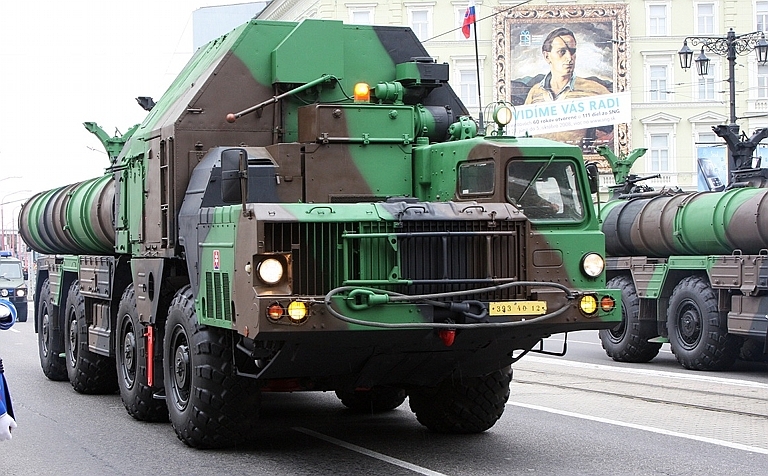 The Belarus built LPPU-83 is a self propelled decoy intended to visually emulate the 9A83 TELAR used by the S-300V/V-1 / SA-12 Giant/Gladiator SAM systems. The decoy is built on an extended PT-76 light tank chassis, and uses actual launch tubes from expended missile rounds. 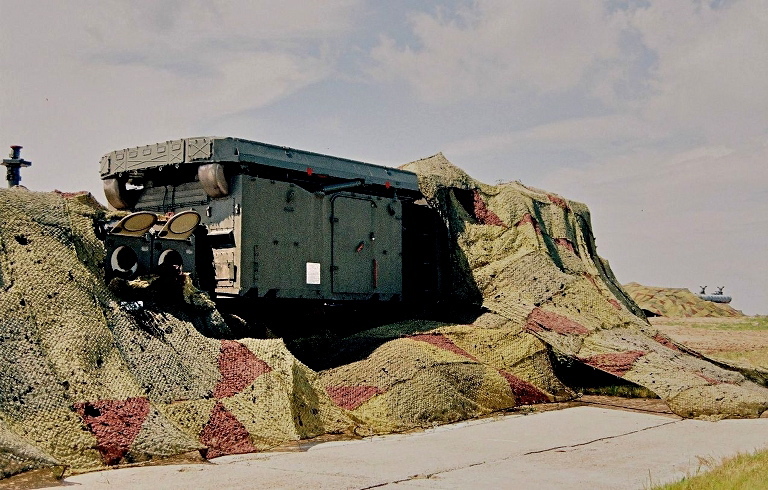 Stowed 30N6-1 Flap Lid engagement radar covered with camouflage netting (© Miroslav Gyűrösi). The MKT-2, MKT-3 and Volchitsa-KR camouflage netting are designed to conceal air defence equipment from electro-optical/thermal imaging and microwave band ISR systems. Band coverage includes longwave, midwave and shortwave infrared bands, and microwave radar bands from MMW down to L-band. optical, thermal imaging and radar assets (light-weight radio-dispersing camouflaging sets: VolchitsaKR-L and Volchitsa-KR-LG – against summer vegetative, Volchitsa-KR-P – desert/steppe and Volchitsa-KR-C – snowy backgrounds). Typical camouflage sets consist of 6-12 standard 3x6m sheets joined with quickly undone seams made of stitched cords. Standard sheets comprise a kapron netlike base with 50x50mm mesh size, backlined with a 3-5mm diameter kapron cord along the perimeter. Volchitsa-KR 50x220mm strips or festoons from metallized two-side painted polyethylene terephtalate film. convenient deliver packages (in covered rolls with spare parts and documentation). 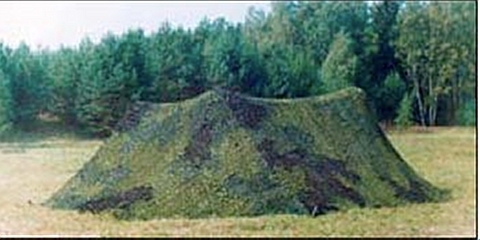 Miroslav Gyűrösi, Russia Develops Decoy to Counter US HARM Missiles, Janes Missiles and Rockets, Vol.10, No.3, March, 2006. Miroslav Gyűrösi, Decoy Vehicle Can Mimic S-300V Launcher, Janes Missiles and Rockets, Vol.6, No.8, August, 2002. Miroslav Gyűrösi, SRTZ-2TM protection system offers anti-radiation missile defence, Janes Missiles and Rockets, Vol.11, No.11, November, 2007. Imagery Sources: Russian MoD, Rosoboronexport, manufacturers, Miroslav Gyűrösi.